All Boston University theses and dissertations are submitted to the library electronically. 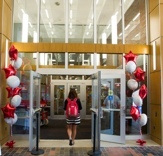 Submitting your thesis or dissertation to Boston University Libraries is the last step to fulfill at the University before you graduate and are awarded your degree. Prepare the manuscript: the pdf Guide for Writers of Theses & Dissertations covers formatting and submission requirements in detail. Consult the ETD Administrator Walk-Through for help. Separately, submit your Dissertation/Thesis processing fee online using a credit card. Thesis prep videos: Take a look at these videos on thesis prep and related issues. There are currently six videos, covering most of the materials covered in workshops you may have attended. Please let us know what you think, and whether you have any additional questions. Microsoft Word template: You are welcome to use this Microsoft Word template prepared by the library at your own risk. Let us know what you think. LaTeX: The Electrical & Computer Engineering Department has a LaTeX template that conforms with proper formatting for library submission that you are welcome to use. Thanks to Professor Janusz Konrad for his help providing this template. Sample formats: A set of samples illustrates proper submission formats. Open access: Boston University’s policy is that scholarship, including BU theses and dissertations, should be made openly accessible as soon as possible so that the benefits of research can be widely shared. This FAQ discusses factors to think about for those of you considering an embargo. The PDF format (Adobe Portable Document Format) requires use of Adobe Reader software. If you do not have this installed, it may be downloaded at no charge. Please visit the Research Guide: Theses & Dissertations – Resources for Locating for information on databases that can be used to identify theses and dissertations written in North America and elsewhere.